them on the plant until they turn color. It's harvest time in the vegetable garden! Learn what to do in August to keep your garden producing for longer. Finish planting fall vegetables such as broccoli, beets, kale, spinach, turnips, and carrots. But first, find out if you still have enough time to plant and harvest that crop before winter. The Days-to-Maturity, usually listed on the seed package or in the seed catalog, will tell you approximately how many days are required between germination and harvest for that particular variety. Some crops like broccoli, beets, and kale can survive fall frost events, but other like bush beans and basil cannot. 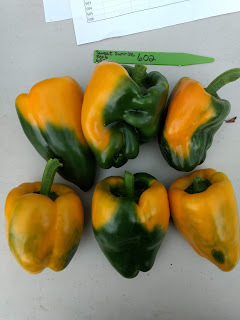 Refer to this article for a list of fall-planted vegetables, their Days-to-Maturity, and whether or not they are frost-hardy. If you will not be planting a fall vegetable crop, consider planting a fall cover crop instead. Cover crops have multiple benefits for vegetable gardens. They add organic matter that promotes healthy soil, reduce the potential for erosion, and help outcompete fall weeds, just to name a few. Fall cover crops can be planted as early as late August, so now is a good time to browse options and place an order. For a list of cover crop options for vegetable gardens, click here. Many gardeners water with hoses that have been sitting out in the sun. The water that has been sitting in those hoses is hot, and hot water could seriously injure your vegetables. Run the hose until the water comes out cool; then it is ready to use on the garden. It happens to everyone: Life gets ahead of us, and we do not get to all the weeds in the garden. Weeds that have survived into August should be removed before they produce seeds. Any weed seeds that remain in the garden can enter the soil and lead to future infestations. If weeds have already produced seeds, dispose of those plants by burning or burying. Putting weed seeds in a home compost pile is risky; while weed seeds can be killed if the compost is heated to high temperatures for long periods of time, such conditions are difficult to achieve in a home or community garden setting. This is one of the most satisfying parts of gardening. Proper harvesting and storage practices help ensure a successful bounty of vegetables that you can share and enjoy fresh, or preserve for the months to come. Several factors go into proper harvesting and storage of vegetables, such as ripeness, handling, storage temperature and humidity. Refer to this article for detailed information on when and how to harvest and store vegetables.